Firefighters Battle Another Vacant House Fire In Shenango Twp. Shenango Twp. Fire Department assisted Station 100 at an early morning commercial structure fire at King Chrysler Jeep. Shenango crews were on scene for nearly three hours. No injuries were reported and units cleared around 7:00 am. The Shenango Fire Department responded to a working structure fire in a vacant house on Shenango Stop Road around 5:30am today. Crews knocked the fire down quick and remained on scene for approximately two hours. The State Fire Marshall was called to investigate the cause of the fire. At approximately 8:00 am this morning, the Shenango Fire Department assisted Slippery Rock Twp VFD at a motor vehicle accident at the intersection of Copper Rd and Old Butler Rd. One patient was entrapped and required assistance by the fire dept for removal from the vehicle. Two patients were flown by air medical helicopter. Shenango Firefighters battled a vacant structure fire shortly after eleven AM on Monday. The house was located near the intersection of old butler road and SR 388, just outside of the township limits. Firefighters were on-scene of nearly three and a half hours. 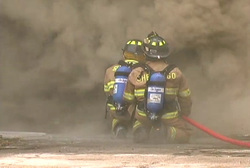 The 2011 Mutual Aid Training Schedule has been posted for members of our mutual aid agreement. Please CLICK HERE to view. The TRAINING page has been revamped and now includes lots of useful information for our fire dept personnel. Shortly after noon today Shenango Fire Department as well as its mutual aid response was alerted for a commercial structure fire on Old Butler Road. Police officers arriving on scene first confirmed a working structure fire with smoke showing. Engines 1206 and 1203 as well as Truck Company 1207 went enroute after the first alarm. Engine 1203 and chief 1209 provided a quick knockdown of the fire preventing it from spreading to the attached residence. Substantial smoke and fire damage consumed the garage area of the structure. Crews remained on scene for several hours with mop-up operations. New Webpage For Shenango Fire Dept. Thanks to everyone that took the time to visit the new webpage for Shenango Fire Dept. over the past week. Our new homepage, www.Shenangofire.com, had 1946 hits in just its first week online. Make sure to check the site for updates daily as we will be posting all the new and exciting news we have to offer. Thank you for supporting Shenango Twp Vol Fire Dept.